1. What is the primary difference between Part 61 and Part 141 flight schools? 2. What background checks and permissions are required for U.S. citizens to being flight training in the U.S.? 3. For a non-U.S. citizen completing a TSA flight training application to train at a Part 61 school, what is listed for the "Flight School or Provider"? 1. In a Part 141 school, the school itself is the certifying instructor. At a Part 61 school, your individual CFI is the authorized instructor and is individually responsible for your training. 2. None. Only non-U.S. citizens must fill out a TSA application, get a background check, and receive a specific authorization to begin flight training. 3. The "school" should be the individual CFI providing the training NOT THE SCHOOL NAME, which confuses most applicants at Part 61 schools. 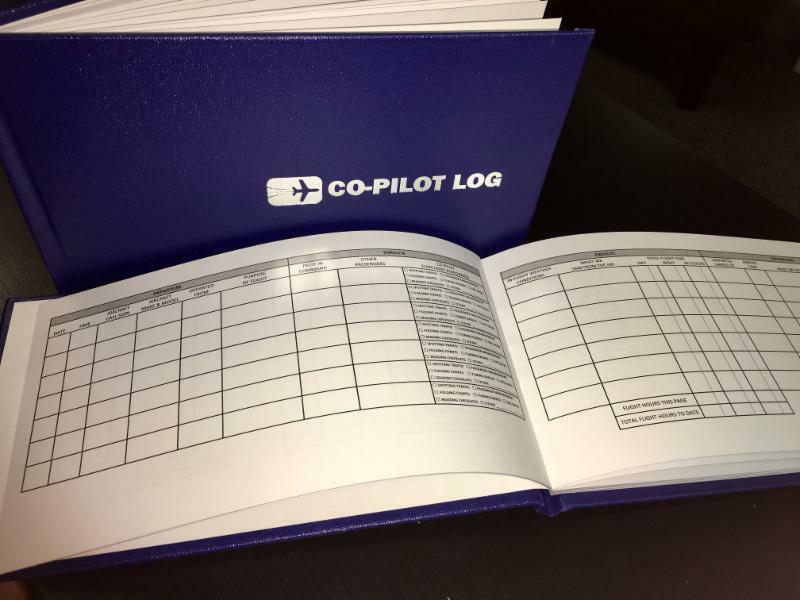 Now your Co-Pilot can Log their Adventures Too! 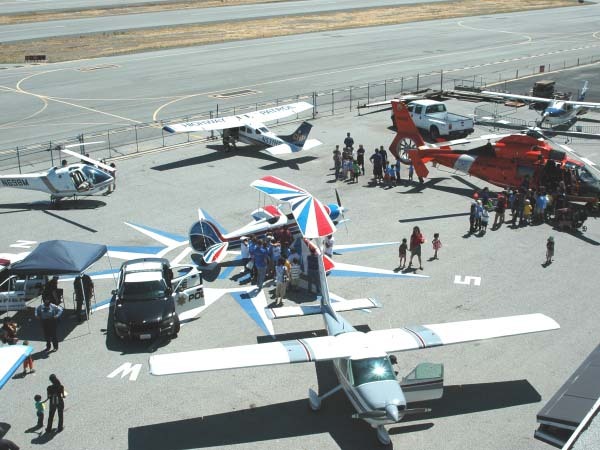 San Carlos Flight Center has created a fun way for friends and family to get involved in your next flight! Let your co-pilot join you in tracking their own hours and mileage they've flown. Giving them the opportunity to perform alongside the pilot, they can check off tasks like folding charts, GPS entry, spotting traffic, reading checklists and more! Makes a perfect gift for your designated co-pilot and any future aviators in your life. Next time you're at the San Carlos Flight Center be sure to pick one up! With summer sun, comes outdoor fun. Our monthly SCFC BBQ happens on the first Saturday of every month. Join us Saturday August 5th for BBQ food and fun adventures for the kids. 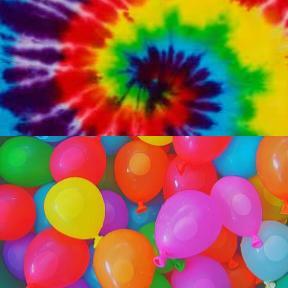 We'll challenge each other to greatness with water balloon catapults, and tie-dye T-shirts with airplane symbols. If your family has yet to meet your Flight Center friends, it's time to bring them by the airport. BBQ starts at 1:00pm, following the noon safety seminar Intro to G1000. All are welcome. Email us with your headcount at info@sancarlosflight.com. San Carlos Flight Center is pleased to release a short video celebrating the women students and pilots of general aviation. The video brings together present and future women pilots, and shows the positive impact that aviation had in their lives. San Carlos Flight Center chose to launch this video project because flying is a visually stunning activity, and the video shows women pilots in action. The video, "It All Began", shows the path that interested women can take to become licensed pilots. From looking out a window, to taking the initial steps into a flight school, the transformation that occurs in a flight training process is displayed in full detail. The video was inspired by the song "A Piece of Sky" written by Michel Legrand with lyrics by Alan and Marilyn Bergman for the movie Yentl. The song chronicles the journey of a woman realizing her potential to follow her dreams, and SCFC's video includes a beautiful cover recorded by Nita Whitaker. The video was created as a summer project, filmed and directed by SCFC staff member Michelle Karpishin, a past winner of the Upwind Summer Scholarship. Karpishin invited all of the women SCFC pilots to participate in the filming, and many responded, eager to share their experiences with the next generation of women pilots. While women are underrepresented in the aviation community, their influence is obvious, from learning to fly and taking passengers to working as Air Traffic Control tower operators. 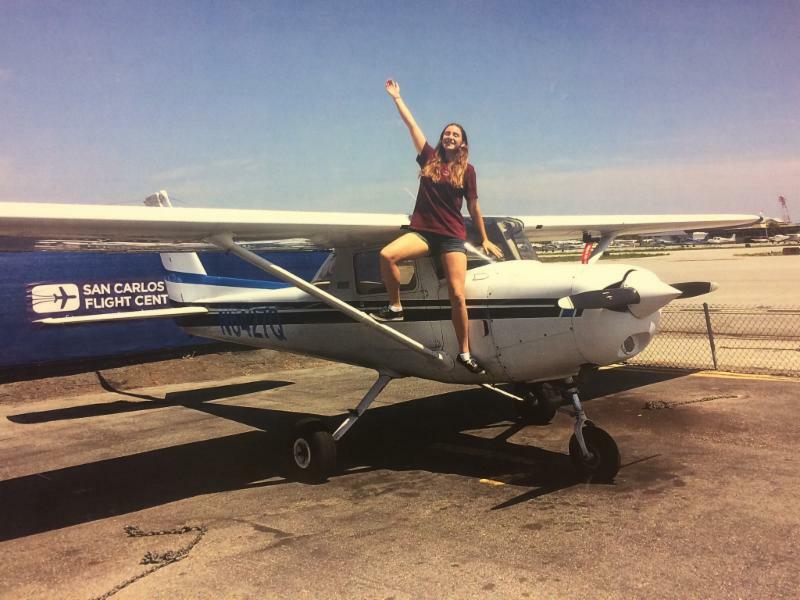 San Carlos Flight Center hopes to show through the video, that women are not only capable of being pilots, but that goals can be turned into a reality if you step outside and start on the path. 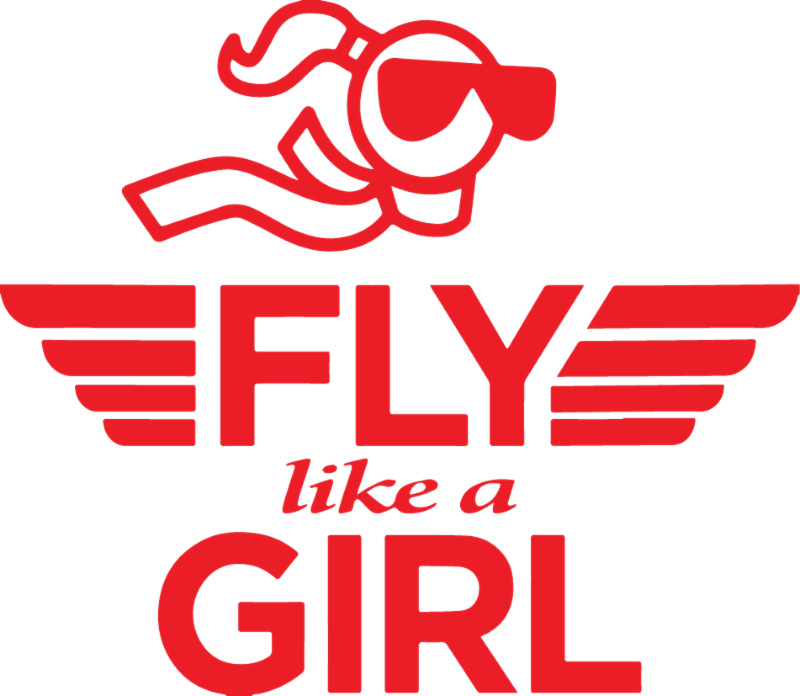 Fly Like A Girl is SCFC's women's pilot organization dedicated toencouraging all women in aviation, both in training and post-license. The video will be available on San Carlos Flight Center's and Fly Like A Girl's Facebook pages, as well as on Youtube.com. San Carlos Flight Center supports Girls in Aviation Day, September 23, 2017. Finding out "About this Aircraft"
The airplane POH is the best place for full and complete aircraft and systems information, but the "About This Aircraft" page can be a place to start. Worrying about Landing? First, Fix your Takeoff! Want a secret way to improve your landing ability? Improve yourtakeoffs! 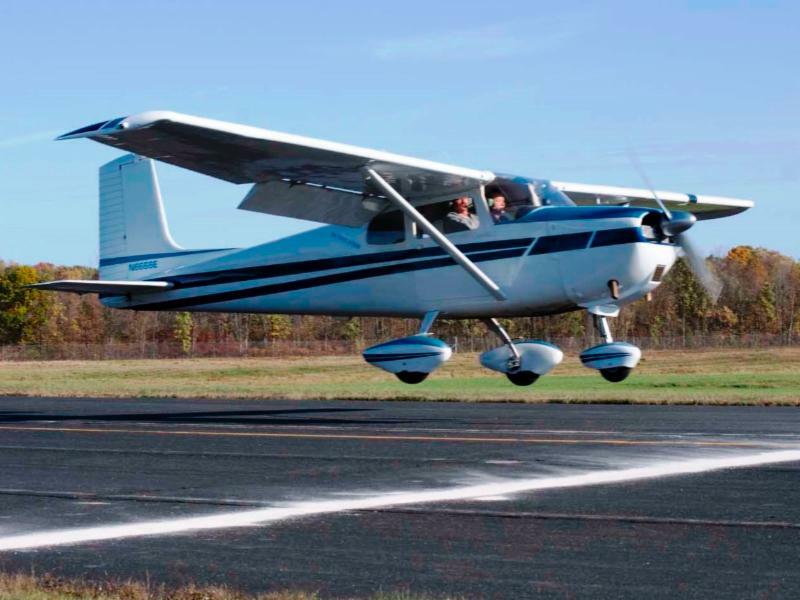 A smooth, stable takeoff includes all of the same skills and techniques as a smooth, stable landing and usually happens faster. Find a long runway, and slow your takeoff down. Try applying less than full power. Rotate the nose as soon as you have elevator authority and pitch for a stable takeoff attitude. While rolling down the runway on the main wheels, focus on staying parallel with your feet and locking the pitch attitude with your hands. This kind of takeoff roll exactly matches the conditions of a stable touchdown and landing roll, so practice the muscle memory and sight picture now. Apply full power and lift off, but keep the nose locked, not moving up/down, left/right, or twisting. The takeoff attitude doubles as a climb attitude. Stay on centerline, parallel, with the correct crosswind correction. If you really want to improve your takeoffs, grab your favorite CFI and build your precision. The summer season brings with it beautiful skies, great warm weather, and numerous opportunities to fly to far off destinations. For many of our members that would mean destinations like Palm Springs, South Lake Tahoe, Truckee, and Las Vegas. For the State of California it means wildfire season. This year has been particularly intense. The wet winter brought beautiful green pastures and wildflower blooms but now this has all dried up creating a perfect opportunity for kindling to spark fires. This means TFRs (Temporary Flight Restrictions) can pop up anywhere. They can also expand and contract as the fire spreads or diminishes. 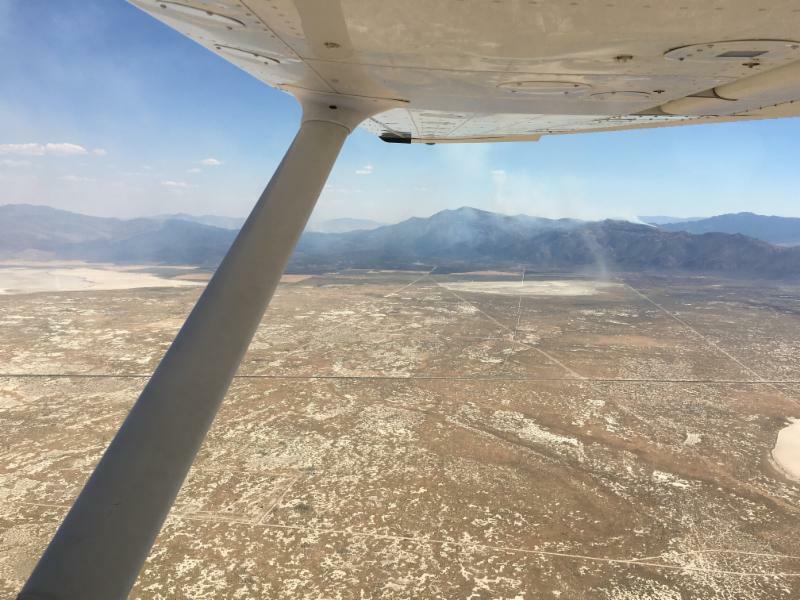 It can also mean low visibility at all altitudes many miles away from the fire itself! 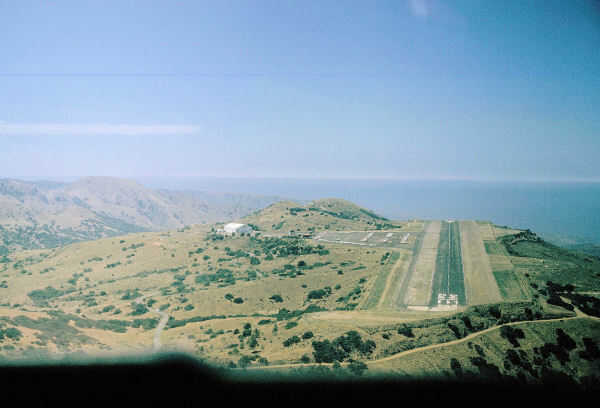 These TFRs provide a safe environment for fire fighting aircraft. This can mean low level helicopter work, smaller fast twin engine turboprops, and large KC-10 fire bombers coming in from the flight levels. When planning flights to any destination be sure to check NOTAMs but also go ahead and get a route briefing for any unexpected fire hazards along the way. Often the TFRs will provide a point of contact and in air frequencies that can provide more information. Listen in on the in air frequencies much like you would while transitioning near an airports airspace for fire fighting aircraft entering and exiting the area. Not only is it better for safety but it can be entertaining to listen to the fire pilots working hard to keep people safe. Kristina is one of our newest member to the SCFC team! Make sure to stop by the front desk and say hi! 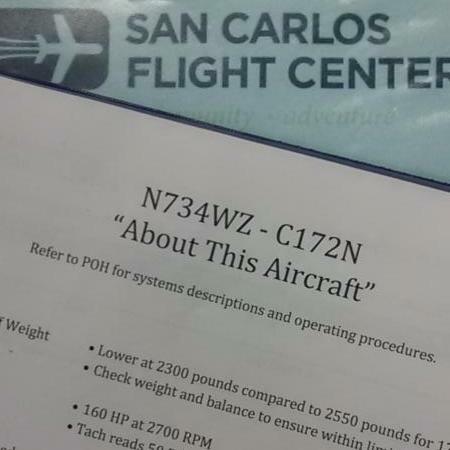 SCFC: What made you first want to get involved with San Carlos Flight Center? What appealed to you? KB: Growing up in Foster City, I've always seen airplanes flying overhead- small planes and those heading to SFO. During soccer practice, my Dad would always look up and point them out since he's always been interested in smaller aircrafts (especially war planes). My neighbor up the street owned a little 4-seater back in the day, and I was lucky enough to be treated to a flight out to Half Moon Bay for lunch when I was about 5 or 6. So I guess you could say I've always been curious about flying on a smaller scale! SCFC: Do you have any interest in learning to fly? KB: Oh absolutely! I want to treat myself to a demo flight for my birthday actually! SCFC: What is your favorite thing about being a part of the SCFC community? KB: The people. I've held many jobs, ranging from amusement park supervisor to retail to stage management, and I've always been a firm believer in enjoying what you do and where you work. I think it's the people who have the biggest impact on your work ethic, and lucky for me, I have found a place that is inviting and interesting, with room to explore and satisfy my thirst for new adventures and experiences. SCFC: What do you do for fun when you're not at the Flight Center? KB: I love to read and bake. I also have board game nights with my friends quite often. I also like to go skydiving every couple of years just to keep things interesting. SCFC: Do you have any other passions? KB: I like to think I'm passionate about a lot of things, but I'd say coffee and Disney are my top two. A few shots of espresso and a day at Disneyland and I'm a happy camper. On August 9th, SCFC will be sharing our aviation passion and participating in the Hiller Aviation Museum Kids Air Faire. There will airplanes and helicopters on static display and activities like Hiller's Sim Zone and build your own balsa wood airplane. Make sure to come check out the SCFC booth and check out the aircraft we'll have on display. San Carlos Flight Center is going to Dave & Busters! Are you ready to challenge your fellow pilots to a few arcade games!? Join Flight Center pilots, students, staff and friends as we head to Dave & Busters. Play some games, grab a drink, and get to know some of the familiar faces around the Flight Center! 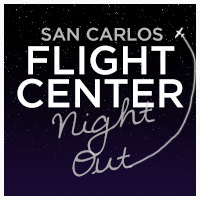 Flight Center Night Out is a social event to give members & staff some unwind time away from the airport and is a great way to get to know each other better. 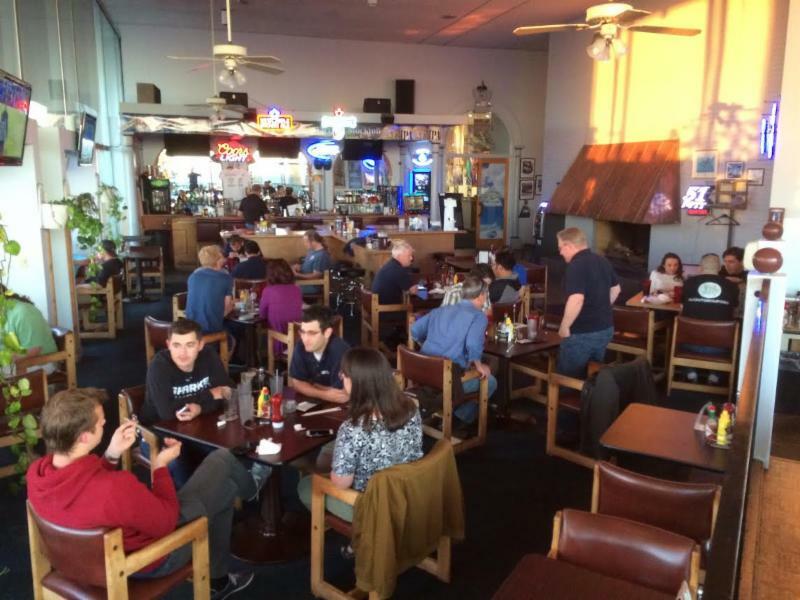 FOG had a great turnout for the Full-Moon Flyers Dinner with Upwind in Stockton. FOG pilots, Upwind students, and families had a great time laughing at inside-jokes about communication hiccups with the tower controller on the way into Stockton. The food was delicious and it was very pleasant to have the whole restaurant to ourselves. We ended the night with a delightful full moon flight back to San Carlos with a gorgeous full moon view. Our next Full-Moon Flyers Dinner is August 6th at Santa Rosa. Make sure to register online to be a part of the fun! Join the Bay Area FlyOutGroup for an annual right-of-passage, the journey beyond power-off gliding distance to the Southern California island of Catalina. The mountain mesa airport is just a short 30-minute bus ride through buffalo infested wilderness to the resort town of Avalon. Fishing, food, snorkel/SCUBA adventures, and fun. Your journey will force you to confront the Los Angeles Class B airspace - either over, under, or through. You'll also make a PIC decision about the flight across the 26 miles of ocean. Bring flotation equipment and cross as 5,500 feet, or climb to 11,000 feet. SCFC members who missed Dave Kramer's July 26 safety seminar on transitioning the LA Airspace and trans-Pacific flight, can view the seminar in our Seminar Video Archive at http://www.sancarlosflight.com/video-archive. On August 21, 2017 a total eclipse of the sun will be visible from within a narrow corridor that traverses the United States for the first time since 1918. Astronomers are calling it the Great American Eclipse. The path of the moon's shadow begins in the northern Pacific and crosses the U.S. from west to east including parts of Oregon and Idaho. The next one will be in 2024. The moon will pass before the sun, and day will suddenly become night. Temperatures will drop, birds will stop singing, and stars will become visible. Totality will last about two-and-a-half minutes. During a total solar eclipse, the daytime sky darkens by a factor of 1 million. 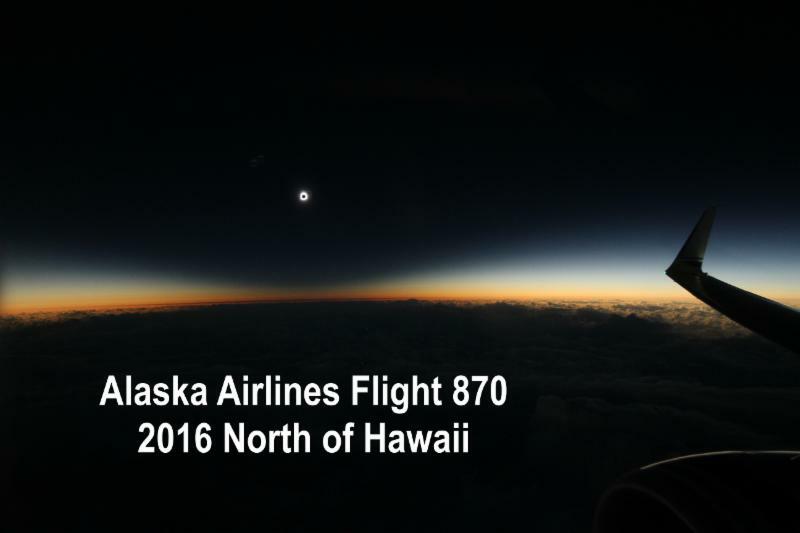 Whether you watch the eclipse from the ground or its shadow from the air, it will be a once in a lifetime experience. 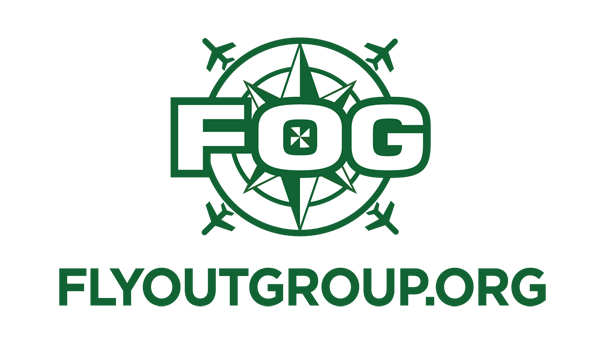 The FOG group is promoting a fly out to the eclipse since it will be so near. Accommodations for the eclipse has been booked for months in the path of the eclipse but we are pilots. We can stay anywhere near and fly to it in a relatively short time. Absolutely do not miss this once in a lifetime experience. Better yet, fly in it. You are a pilot! You can watch it from the ground when you are old and gray.